II. Product Summaries: Scinova Technologies designs software products to help drug discovery researchers create enriched sets of probable drug candidates from large corporate chemical databanks. This objective is achieved by developing and deploying customized data warehousing and data mining solutions for biotech, drug discovery, diagnostics and chemical companies. 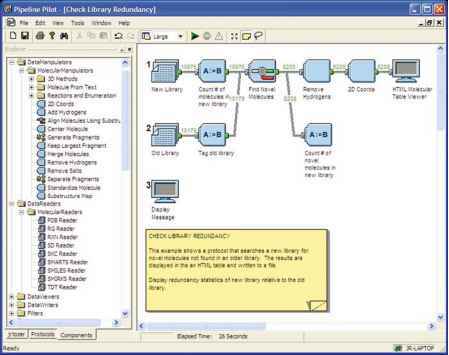 Custom software can be created for specific customer needs and they undertake simulation and modeling studies for ongoing, dynamic biological and chemical data /processes. 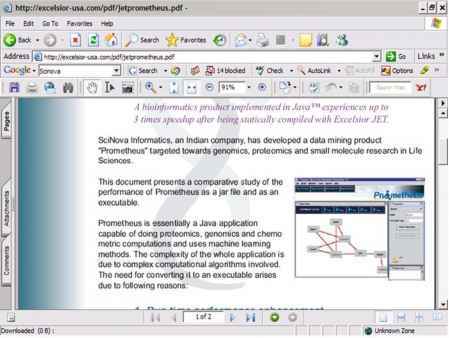 Main product offering consists of Prometheus, Chemlab and Rx. i. Chemoinformatics - Molecules can be designed using "chemical rules" generated from known activity data. Prometheus presents the resultant "equations" relating the properties of newly designed molecules to their biological activity in an intuitive manner to the practicing medicinal chemist. ii. Bioinformatics - Annotated data models can be built in Prometheus and is complimentary to string similarity-based approaches used in conventional bioinformatics. These models find application in promoter prediction, fold identification, sub-cellular location prediction, GPCR classification, and identification of drug targets (e.g. essential bacterial genes). iii. Medical Informatics - Machine learning and non-linear methods can be applied to the diagnosis and detection of cardiac anomalies using Prometheus. Annotated ECG data can be also analyzed using this package. iv. Natural Products - Scinova has developed a natural products chemistry software platform for Astra Zeneca Research Foundation, India, to assist in the structural elucidation of compounds isolated from plants, fungi, bacteria and other organisms. 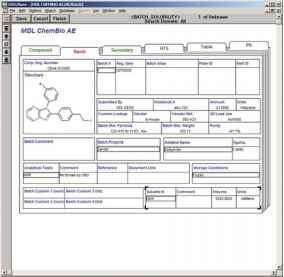 b. Chemlab is a knowledge management software package that collates analytical data for laboratories. It has been designed by lab managers, scientists, and technicians and coded by software experts. Chemlab provides powerful querying and reporting tools so that reaction yields, product purity, and inventory management data can be rapidly and easily generated. c. Rx is a medical toolkit for calibration, annotation, characterization and prediction based on ECG signals. It can handle a large number of signals at the same time and can be configured to sit on a database of signals. Rx can take in data in a variety of standard formats including image formats. It can annotate various parts of the signal, such as qrs intervals, T wave, left bundle and right bundle block beats to provide a more transparent view of the data. After annotation, Rx calculates various characterizes for the signals. These characterizers fall in three broad categories. 1. Physiological: these include heart rate, stroke volume, blood pressure, Rr intervals, vector cardiograms, and 3-D vector cardiograms. 2. Statistical Means: variances, peak to peak amplitudes, Fourier transforms, correlations and cross correlations, histograms, and medians. It can also apply low pass/high pass filters to the signal to sample and vary sampling frequencies. These features are then passed on to machine learning algorithms to classify the signals. In particular, multifractal properties are a clear indicator of arrhythmia in ECG signals. The onset of deformity in the ECG signal has a signature pattern that can be used to predict the onset of a heart attack. Scinova proposes to exploit this feature of Rx as an early warning system for intensive care units. The benefits of presenting chemoinformatics data in an intuitive manner make Prometheus an obvious asset to researchers. 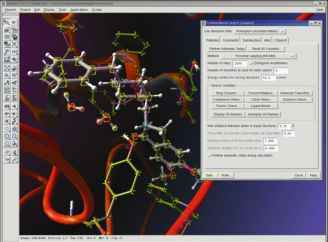 The customizable software being developed for chemistry of natural products should enable scientists to rapidly process large spectroscopic data sets and solve the structure of new isolates more efficiently. The machine learning aspect of the medical informatics component holds significant future promise. Additionally, the characterization aspect of Rx's toolkit is particularly attractive for medical practitioners. Fully developing the early warning system component of Rx's toolkit would increase its usefulness in ICU's and the medical community. a. Pipeline Pilot (http://www.scitegic.com/products_services/pipeline_pilot.htm) is a high-throughput data analysis and mining system that allows one to define and perform a complex series of operations on extremely large data sets in real time. Automated data analysis pipelines can be saved for future re-use or shared with a broad community of users within the enterprise across the web. a. Ability to process entire data sets so analysis is not limited to the tables of a conventional database system. b. Statistical methods can be employed which consider numeric, text, categorical, binary and fingerprint data simultaneously. c. Ability to pipeline together several disparate data sources, or even query on derived or calculated information. d. Ability to evaluate or process multiple data sets as if they were a single source. e. Ability to run ad-hoc queries using derived information calculated on the fly. f. Ability to query raw flat-file or web data as if it were already stored in a fully annotated database. g. Scitegic distributes NovoDynamics' ArborPharm(TM) product that uses a recursive partitioning methodology that allows for high throughput mining of large pharmaceutical discovery data sets. Components that can be used to manipulate data in/from different databases. When the Computational Components are linked together into pipelines, they form a protocol that integrates the performance of multiple computational steps. Pilot system to take advantage of its high-throughput nature and accommodation of multiple data types. Pipeline Pilot is aimed at processing data based on user-defined rules or filters, but for chemical reaction transforms where the compound enumeration can follow complex rules, parallel reactions, and crucial compound definitions such as stereochemistry, salt forms, tautomers, etc., the use of Pipeline Pilot is non-trivial. Pipeline could be used for alternative applications if it is complemented with additional tools and environments. The technology is partially open for such user-defined extensions.